2010..... Love, Hope, and Healing!!! In January we had just begun ABM with a practitioner near us. After our first intensive session we saw many cognitive and physical improvements in Makenzie. I was driving Makenzie downtown often and life was a bit crazy! Makenzie began to get much more movement in her hips and was finally able to bear weight through her shoulders! Therapy, therapy, therapy, was February's theme. I was trying to decide were to go with ABM. Were we going to stop traditional therapy for a while and just do ABM, could we do both, or would ABM have to take a back seat a while. This was an incredibly stressful decision for me. Makenzie arched her hips all by herself many times this months and I could not have been any more excited! Makenzie and I made special cards for her Valentines day party at school and she also received an amazing blanket from Jackson's Blankies for Babes! March was a really great but very busy month. We traveled to San Fransisco to meet Anat Baniel. She was really great. Makenzie loved her lessons, the beach and time with just mommy while we were away! We also got to meet Makenzie's friend Christian and his family this month. We had a lot of fun hanging out, playing at the park, visiting doctors, taking pictures, and having lunch with with Cici and her mommy too! What a great time with good friends! What a beautiful spring day it was for a walk around the lake and time at the park!!!! Stem cells in Costa Rica, Easter, and G tube feeding, all happened in April. We traveled to Costa Rica for more stem cells with some very good friends of ours, Julie and Joey, Brock, Lisa, and Al, and Gracie, Jennifer, and Scott. We had a wonderful time while we were there and each and every one of us arrived safely at home when our trip was through. Our family shared a wonderful Easter together. It was a beautiful day and we spent a ton of time outdoors playing basketball and enjoying each other. At the end of the month Makenzie's J tube broke on a Friday afternoon. I put a g tube in her and despite many people who thought Makenzie would not do well with food in her stomach she is still G tube fed today and doing well!!! The weather was changing and it was time to spend much more time playing in the yard. We took our first trip to our family's cabin in May since Makenzie's accident and had a blast taking a hike, sitting in the hot tube, socializing at Starbucks, and being together for the last time before my brother headed to Korea for at least a year! Makenzie and I also attended a Mothers Tea put on by CP of Colorado. We had a lovely time chatting with new friends and watching all of the amazing kiddos strut their stuff down the runway for a Gap fashion show! June was another busy month. My good friend got married and had little baby Morgan. What a fun time that was cuddling with a bitty baby and watching as my friend said her vows to her brave husband who had traveled all the way from Iraq to get married and see his son be born! 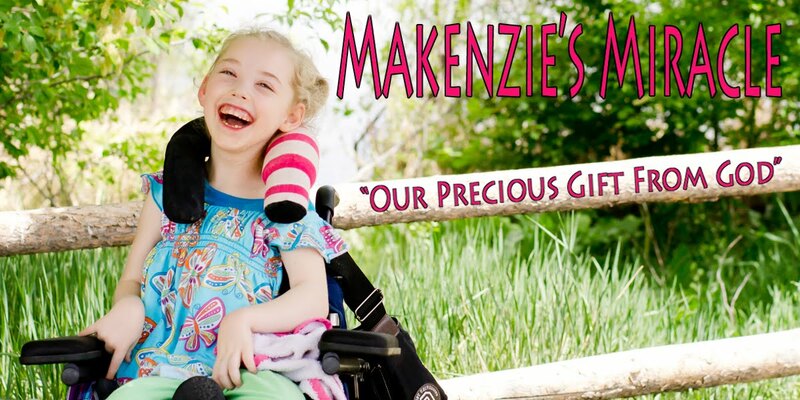 This month we also started the process of getting Makenzie a new wheel chair! She was such a trooper and at the end of our quest for a liner seat made the decision to start the long process of obtaining an Aspen seat for Makenzie! Fire Works, birthday party, iPad, and airplanes are the words that describe July. We celebrated the Fourth of July with our friend Julia and her family. It was a ton of fun to watch the boys light off fire works, run around while getting wet on the inflatable slide, and see Makenzie's face light up at the lights and sounds of all that was around her. We had a birthday party for Makenzie at our house with close friends and family. She laughed so hard when we sang happy birthday and she got some really great gifts including the iPad. The iPad changed life for Makenzie. It motivated her for the first time since her accident to really use her hands and arms. She began to be interested in learning her letters, colors, and name, through different apps. We also traveled to AZ to spend so much needed time with my great friend Michelle. We also took time out for a week of ABM while we were there with Joey and Julie. In total we were gone for 3 weeks and enjoyed all of our time away! What would make a summer complete but a trip to the amusement park, and a family reunion. We traveled about 2 hours away into the mountains to hang out with our whole family this summer. Even though I forgot Makenzie's wheel chair and had to go and by her an infant stroller we had a great time! We put our feet in the stream, played mini golf, road go karts, fished, and much more! Then it was time for Makenzie first day of Kindergarten. She looked so dang cute and all of her classmates loved her twinkle toe shoes. She had a wonderful first couple weeks of school before I realized that the district was not going to provide Makenzie what she needed and I pulled her out to home school her. September was a months to relax with friends and take time out to document this time in our life through pictures. Thank you Mary Beth for giving us memories that will last a lifetime! October began Makenzie's homeschooling adventure. She loves to learn and is so proud when she learns something new! We also went to a softball tourney for the Rise school and had a great time hanging out with friends, watching the clowns and making animal balloons! Makenzie also had a much smaller g tube button put in and since then she has been doing much better on her stomach. Sometimes the most simple things make the most difference! November we had a wonderful Thanksgiving again with our family! The boys went out to the park and played football before dinner and then we all ate way to much! We met another friend this month! He is an amazing 3 year old little boy named Giovanni. His mom and I have so much in common and it has been a joy to get to know Christiana and her family! Makenzie also got her new braces this month. They have greatly decreased the sensitivity in her feet. She has begun pushing into things instead of flexing away from them. It has been amazing to watch! Again simple things, huge difference! This month our family grew by 2 with the birth of my niece and nephew! After 9 weeks of bed rest they were both born completely healthy! I can not wait to watch them grow into amazing little people!!! I am so proud! Makenzie also finally got her new chair! It was quite a process but she looks amazing in it and make such a world of difference in so many areas but the biggest for me is the decrease in Makenzie's reflux since she has been positioned correctly!! We trimmed the tree, made gingerbread houses, saw the Nutcracker, had many great dinners and wonderful time with our family! This has been a blessed year of family, friends, love, hope, and healing!!! Thank you for all of your prayers and support this year! Here is a slide show I made a slide show of all of our Christmas fun. Enjoy! Today as I was driving to the mall I was listening to KLOVE. They were talking about the idea of not making New Year resolutions but instead picking one word to live by for the upcoming year. My One Word | Sarah Beakes - "Express" from PC3 on Vimeo. Being a person who has never made a New years Resolution in her life this proposal really got me thinking. Even though I do not make resolutions I do have many areas in my life where I would love to change and grow. The ever growing long list of things I could or should do is realistically unreachable. One word however, is do able. So I have been thinking all day about this "word". There are so many powerful words. I began to think picking a word would be a huge challenge until I started catching up on some of my blog reading tonight. I was checking out Charlie's mommy's blog at, A Bird on the Street, when I came across this post. In her post titled My Christmas Story, she talks about embracing surrender. It is two words but really just one action. Those two words feel so relevant to my life and have been something I have been trying to understand for over three years now. I can not fix Makenzie's brain. The doctors can not fix Makenzie's brain. I could write a book on most every traditional and non traditional therapy out there but the bottom line is only God can heal Makenzie and bring her full restoration. The only thing I can really do in this process is "embrace surrender"! There are also many other things is this life that I can surrender. MANY! So there it is my New Years resolution in one word two words. Embrace Surrender! Powerful! Let the New Year begin! When I said that we had crossed the Christmas finish line I was mistaken! Today Grandma Linda came over for the very last Christmas celebration. It was short but very sweet! The boys had a ton of fun and Makenzie loved opening her presents. More then anything she loved the tissue paper! Makenzie had a great day in therapy and there was very little reflux and NO vomiting today! Thank you so much for the prayers! God is good! This evening Makenzie, Morgan, and I braved Target in our pajamas! As I was putting Morgan in the cart I could hear someone talking to Makenzie. People do that alot so I just went about my buisness until I faintly heard the gentle man say something about the special olympics. I looked up to see a young man with Down Syndrome and his father. I smiled and we introduced ourselves. We stood there for a few minutes talking and then the young man helped me push the cart to the isle we needed and we said our goodbyes. I love moments like that. I did not know this man and his son from Adam but somehow there was a connection. There I was at target. Pushing my daughter walking with a skip in my step next to a young man who could see the special in Makenzie and two strangers who could see the beauty in each others children! I am still digging out. Digging out from underneath Christmas, house guests, and having all of the kids home from school for the last week and a half. I really hate digging! It seems like I have spent all of my free time picking up, wiping down, cleaning off, and organizing, just to make a small dent before it all gets undone over and over again. Then there are the continuing events, appointments and the unwelcome return of the vomit monster the last couple of days which had us running to the doctor's office this afternoon. I am tired. I am feeling quite buried. I am so ready for the kids to back to school, Makenzie's appointments to be at their normal times, and life to have order again! I love this time of year but I am officially DONE! Today my goal was to get the laundry done and the boy's rooms in order. The rooms are more or less done but tackling the laundry was a bit too tall of an order on top of therapy, a nurse visit, a trip to the doctor, and a busy 6 month old. Makenzie threw up again after breakfast. Sometimes the worsening of this symptom can be strep of flu. Makenzie has neither so we will just wait it out and hope it is just a short stomach bug that gets better in a few days. I really have not had time to stop and realize how well Makenzie has been doing in that department until she lost her lunch yesterday. Yes, she has still been refluxing but not too bad and there has been no vomit for a LONG time! I have changed nothing so I am at a loss other then she may be sick. Please pray this goes away. On a more fun note, Makenzie and I had some fun this afternoon playing peek-a-boo on the couch. She would slump over and I would say peek-a and by boo she was sitting straight up with giggles pouring out from the huge smile on her face! So much fun! Tomorrow I plan to accomplish the laundry! I have nothing going on .... yet.... other then on therapy appointment. I really hope it stays that way! This is the scene we closed out Christmas with! It was absolutely gorgeous! We have officially crossed the Christmas finish line! Getting together with my family is always a ton of fun! This year we met at my aunts house which is about an hour away . Packing the car was a ton of fun considering this afternoon I also started my three night and four day adventure of taking care of Mr. Morgan while his mommy and daddy had a weekend together in Vegas! I loaded the wheelchair, 2 diaper bags packed to the brim, pictures, toys, a portable swing, and of course all five kids and we were off! Makenzie had a pretty good day other then the fact that she was very refluxy. I am not sure if she is getting sick or if she just spent too much time in the car today. As soon as we got to my aunts house she lost a good portion of her lunch so I opted her out of dinner as we had a long drive home through the middle of nowhere and did not want to risk her getting sick in the car. As much as I love the Christmas season I am ready to get back to life as usual. I guess that makes me a scrooge but all of this running around and being off of the normal schedule has worn me completely out! Makenzie and Morgan are fast asleep. The boys are an their way to bed. I am sure once I decide to lay my head on the pillow a certain little six month old will decide it is time to eat again and my quest for rest will have to wait for a little while longer! I must love that little man a whole lot!!! Today was a day that could have come straight from the movies. As I sit here listening to Christmas music and helping my good friend set up her son's new iPad up over the phone I am glowing. Words really can't express how truly amazing I feel tonight on this Christmas Eve. Today we headed out to see The Nutcracker. Getting 10 people out the door all dressed up is quite a job but we got it done and everyone looked amazing. We of course arrived with about 30 seconds to spare and the curtain opened as we were settling into our seats. The seats were amazing and everyone could see the grandness of the stage and dancers. Makenzie sat straight up in her wonderful new chair with her eyes fixed on the ballet. After about two minutes she got the biggest smile on her face and turned to look at me with sheer excitement in her eyes. I nuzzled up next to her and tears started to stream down my face. I am not sure I can explain the exact feeling but seeing her beautiful heart shaped face so happy was just a bit more then my heart could handle. There I sat, at a ballet, with all of my kids on Christmas Eve and even my daughter was enjoying herself. Three years ago I wasn't sure she would ever enjoy anything the way she did today. Tears came at the realization of how utterly perfect and beautiful my family is. I am pretty sure there is not one single Christmas present that could out do the feelings of complete peace and joy I felt this afternoon. The only thing Makenzie did not care much for was the cymbals. There were a bit much for her sensory system but there were no tears, just a very concerned look every time they crashed together. Thank You so very much to the Colorado Ballet for making this all possible! As soon as we got home the boys started in on the excitement of Christmas morning. They tried to put themselves to bed at about 7:30pm. Ah no.... that equates to a 4:30am wake up and that is not happening!!! So I turned on A Christmas Story and we sat together to watch it and as soon as it was over all 3 of my kids raced to bed! So now Santa has to work "his" magic before mommy can go to bed and then it will be CHRISTMAS!!! I can't wait to see the innocent joy in my children's faces tomorrow morning! I can't wait! Santa, Gingerbread, and So Much More! We kicked off our Christmas weekend today. It was a crazy day but my kids had so much fun! Makenzie and I started the day by going to sit on Santa's lap. She gets to excited when anyone talks about Santa. I asked her the other day if Santa was going to put presents in her stocking on Christmas and her eyes lit up and giggling ensued. This year is the first year Makenzie has gotten excited about Santa so Makenzie had to go sit on his lap! She smiles and then proceeded to nuzzle herself right into his beard! I personally thought when push came to shove she would be scared but nope, she loved it! Then it was time to rush home to get ready to build our annual Gingerbread House. Once all of the sugar was laid out and ready the madness began! After sticking the candy and frosting covered pieces together about ten times the roof finally stopped sliding off and the house stayed in one gloppy piece! Oh so much fun! We had a wonderful dinner and exchanged gifts together.When I set the wrapped present in front of her she got very excited! Inside was a set of pull back cars that she LOVES!!! They are rounded at the top so she can help hold them, pull them back, let them go, and watch as they race and spin across the floor! The day was not done yet! Tonight was our churches Children's Christmas Service. Getting my whole gang out the door at 6:30pm was honestly the very last thing in the whole world I wanted to do but somewhere deep inside I mustered the strength and we headed out the door. I am so glad we went! Everyone loved it! It was a very well put together play full of laughter and song. Makenzie watched every second! I am so glad we went! It was well worth the effort! Everyone is now tucked into bed! I am so tired but my heart could not be any more full! I love the Christmas season! This year has already been so full of blessings, generosity, and love! Tomorrow Christmas will continue with a trip downtown to see the Nutcracker!! What a day! What a day! This summarizes it pretty well! It never ends and I am going to bed! LOL! I swore a while back that I would never again go to a studio to get our pictures taken. I have be spoiled by having a really great photographer take amazingly wonderful pictures for our family. Not only are the pictures beautiful but the experience is fast, fun and, painless! Today I broke down and went to a studio that prints the pictures while you wait with my friend Erica and her family for some super last minute Christmas pictures. Let me just tell you............. I will NEVER EVER do that again! When I called I asked for 2 appointments. They only scheduled one. They took all the pictures super fast not taking time to get the perfect shot. When we were done they could not split the order because "the computer wouldn't let them" and we had to sit there with all 7 of our kids to try and figure out how to split the order while they sat and watched. As we all huddled around the computer to choose our pictures I was very disenchanted. While I may not be anywhere near a professional photographer I do know there is a very precise art to lighting, angles, and aperture. There is much attention to detail needed. While we were taking the pictures, I .... the customer.... sat and removed gaps from each of my friend's family photos. I wondered if the people taking the pictures had much more then the knowledge of the classic point and shoot. We took a group shot and when we looked at our options I asked the photographer why no one had said anything about the positioning of Makenzie's arm. In every single picture it was sticking straight out on top of Erica's head. She just gave me a blank stare and answered my question by changing the subject. This is an art people! Geez! Needless to say we did not wait for our pictures. I will go get them in the morning after I have a little chat with someone higher then Miss point and shoot. At the end of the day we may not have any pictures after the agony of getting 10 people ready, out the door, and smiling! I missed Mary Beth today! I want real, unscripted, natural photos! I swear I will never cheat on her again with any studio.... EVER! We won't be doing that again! However, we all survived and had a great rest of the day! Tomorrow I plan on finishing up everything I need to do for Christmas! I think I am in for an adventure! I have waited and dreamed of this day for 13 years. Today my little brother became a daddy times two!!! Makenzie and I went to the hospital this afternoon to visit for a little while. I am so happy for my brother and his amazing wife! After 2 months of bed rest and a few pre term labor scares I have a perfectly healthy niece and nephew!!! Yeah God!!! Makenzie had a wonderful day. We only had speech today and her therapist was amazed at how well she did in her new chair. To be quite honest I am still amazed as well! Tomorrow will be one full week since we brought her chair home and honestly I can say that both Makenzie and my quality of life has greatly improved! For starters and most exciting, Makenzie has not be refluxing much at all while being fed in her chair!!!! I realized today that Makenzie has worn the same outfit ALL day for 3 days now! I have not carried around a burp rag and other then the normal drool I have not found spit up in her hair or on my floor all week! The extra support has allowed Makenzie to use her arms a ton more. I have been putting the tray on and Makenzie insists on having toys to play with! She has been touching, feeling, and pushing the buttons with very little flexion and much pride! She is tolerating the foot plate well and it seems to be helping to desensitize her feet and she is tolerating weight and touch a ton more. I have noticed that Makenzie has not been flexing against everything that touch her feet while on the floor resulting in her curling up in a ball. Instead she has been pushing off of anything that gets in her way to move herself all around the room. She has also be more accepting of putting weight through her feet to bridge her hips while on her back! As for me, there is something about seeing my child sitting strait up that makes my heart feel lighter. It has given me more energy and motivation to do the daily rum drum stuff because I know my princess is not laying on the floor in a ball, she is not flexed and crooked in a chair, and she is entertained with toys in front of her instead of the TV. It is invigorating! I still can't believe one chair could make that much difference but it has! There are only four days until Christmas and I am almost ready.... almost! The next four days are going to be crazy! Someone once said that it takes a village to raise a child. I have been thinking about that village a lot lately. I have been thinking about who is a part of that village. I have been thinking about the many cultural differences there are out there when it comes to who helps raise our children. As a mother to a child with special needs my village seems to look a bit different then most in this culture. I have many people in and out of my home on a daily bases. I have had to ask for help with cooking, cleaning, and errand running. Even though sometimes hard, I have had the honor of accepting gifts and other monetary help just to get by. I have poured my heart out to so many and have asked people to go above and beyond. Many times I have disagreed with others about what a village should look like and how to make it work for my family. Last night Makenzie and I went to a Christmas party at a good friend's house. This friend is a part of my village. The party was a ton of fun but there were a bunch of people and lots of noise. Makenzie was already on the tired side so she wasn't handling it all that well. One I could tell she had had all she could handle I found a quite bedroom and we laid down on the bed. She looked at me and smiled. I asked her if she was ready to go home and her grin got bigger.... so we packed up and headed home. As soon as we got home I laid Makenzie in bed. She was on a bit of a sensory overload so I wanted to wait until I knew she was good and asleep before I crawled out of bed. I woke up this morning to a beeping pump and a sleeping girl. At first I was really confused. I took me a little while to figure out what was going on. I fell asleep with Makenzie. I did not wake up to start her bag but that was ok because my village (Erica) came to the rescue by starting her water and dosing all of her medicine. I was in heaven this morning. Every night as I lay with Makenzie, I think about how nice it would be just to close my eyes and go to sleep. Every night I crawl my tired self out of the bed so that I can do water and medicine. Last night for the first time in almost 4 years I got to fall asleep knowing that Makenzie would be taken care of..... and she was!!! My village! I am sure going to miss having this part of my village here when they head home after the holidays! Then today we headed to a Christmas brunch with Zakk, Erica and their extended family. We laughed and ate. The little girls chased my two youngest boys around all morning. Josh gave them all piggy back rides and everyone acted as if they had know us forever! Their family opened presents and my boys even got a few! My village. This afternoon Santa showed up at our door in the form of three little blonde haired beauty's and their parents. Their family had been given our name from the church and were so excited to share the Christmas spirit with our family! They were the cutest little things I have ever seen..... ok.... except for my own kids....... and their generosity will not soon be forgotten! My village! I love my village! There are many more who stand with our family! I did not forget about you but I would be at this keyboard all night! My village may not be what most would choose but it is mine and works for me! What does your village look like?